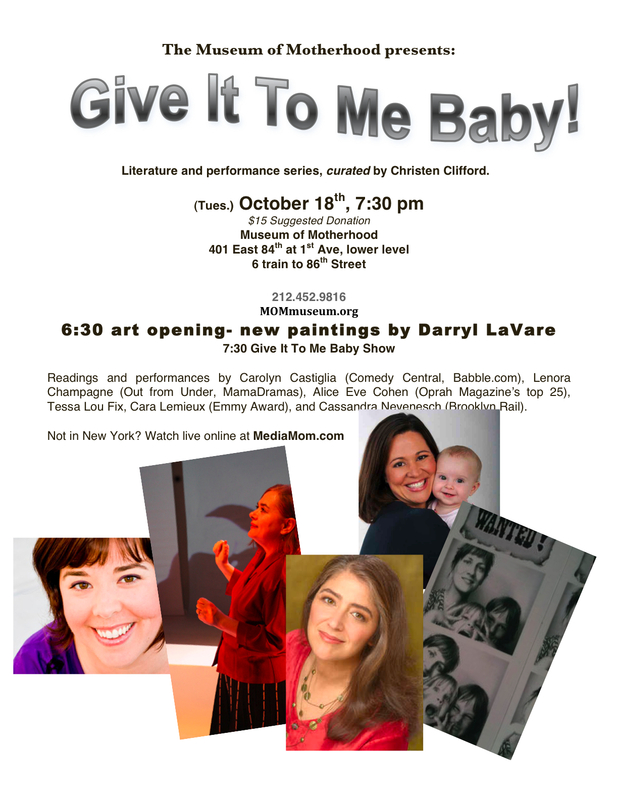 Give It To Me Baby – Rocks The Night On Tuesday Oct. 18th at M.O.M. More: Carolyn Castiglia is a New York-based comedian/writer wowing audiences with her stand-up and freestyle rap. You may recognize her hip-hop alter ego Miss CKC from Comedy Central, VH1 and MTV2. Carolyn’s web vids have been nominated for an ECNY Award and featured in two issues of EW magazine. She’s appeared in TONY, The NY Post, The Idiot’s Guide to Jokes and Life & Style. You can find Carolyn’s writing online at Babble.com, MarieClaire.com and The Huffington Post. Lenora Champagne has been making work as a performance artist, playwright, and director since 1981. She has received three fellowships from the National Endowment for the Arts, commissions and project support from the New York State Council on the Arts, residencies at the MacDowell Colony and Yaddo, and the Franklin Furnace Fund for Performance Art. Champagne’s publications include Out from Under: Texts by Women Performance Artists and performance texts, plays and essays published by Smith & Krauss and in Plays and Playwrights 2009, Performing Arts Journal, Performance Research, Women and Performance Journal, Chain and The Iowa Review. She is Professor of Theatre and Performance at Purchase College, SUNY. Alice Eve Cohen is a writer and solo performance artist. She will perform from her memoir What I Thought I Knew, one of Oprah Magazine’s “25 Best Books of Summer” and one of Salon.com “Best Books of the Year”. Cassandra Neyenesch is a journalist and novelist. She writes about art for Art in America and the Brooklyn Rail and is the author of two novels. She is currently finishing her first YA novel. Artist Darryl LaVare is a painter and performer from Memphis, Tennessee. She is a graduate of The Rhode Island School of Design, and moved to NYC in 1990. She has shown at Max Fish, CBGB’S Gallery, The Limelight, Danceteria, Exploding Sky, Supreme Trading, Wooster Projects, Stendhal Gallery and The Brooklyn Historical Society. Christen Clifford (curator) is a curator at Dixon Place (Experiments and Disorders). At the Culture Project, she created and curated the long running series Heat. Her work is strongly influenced by feminist art and the art of mothering. Her solo BabyLove, about maternal sexuality, had its premier in Ljubljana, Slovenia and toured San Francisco, British Columbia, and ran for three months in New York, where it was named Critic’s Pick by New York Magazine, NBC, and Time Out New York, which gave BabyLove five stars.